Exercise ! At least An Hour Every Day ! - Home... Excercise! Exercise ! At least An Hour Every Day ! Our bodies were meant to MOVE--- they actually crave exercise! For example our motto above: "Get out & play an hour a day!" It really means go outside and getting some exercise. Without exercise, it could reduce the risk of many diseases. Some of those diseases could be cancer, heart disease, and many other deadly diseases. 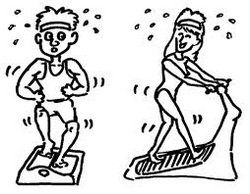 Many people stay fit and exercise by either dancing, jogging, going to the gym, sports, or others.